Interests:"A woman living out her true design will be Valiant, Vulnerable, and Scandalous"
travel, hot rods, rockabilly, music, family, cars, celtic things... laughter and making others laugh... i have a lot of interests. Now one of the reasons you like Home Depot wouldn't be because they sponser Tont Stewart would it. Naming your NASCAR picks is almost more dangerous than discussing politics or religion! of course being the rebel i picked the allblacks, the verb, and mr bean. on the east coast bbq is a noun...out west its a verb..but dont try to tell these southern folks that!!! on the east coast BBQ is a noun...out west it's a verb..but don't try to tell these southern folks that!!! In most parts of the southeastern US, BBQ is a passion. Wars have been fought over lesser issues. Feuds have started over BBQ styles. 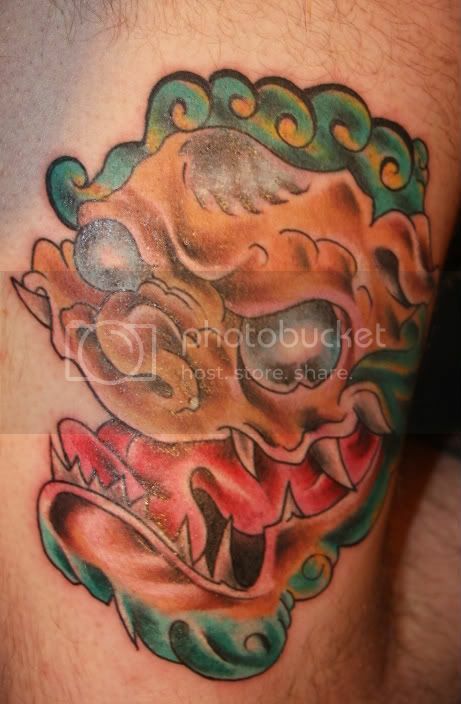 anyway..i had dropped in on a local tat shop, explained what i wanted to do and asked what they thought...2-3 told me they couldnt understand the concept and it wasnt their style and they just didnt "see" it. 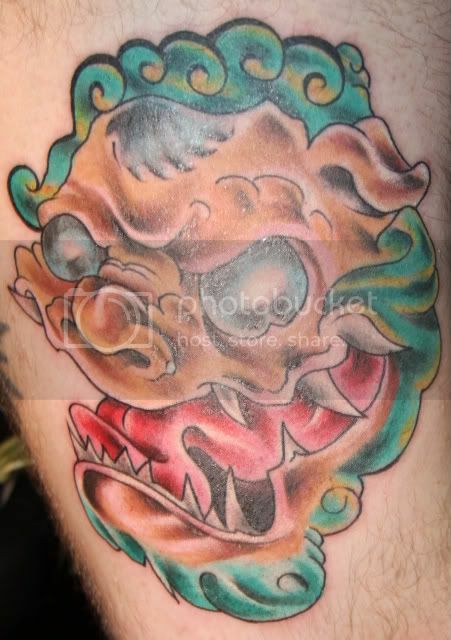 just as i was about to say bag it..they had one of the other artists come out...she does mainly old style pin up stuff...but she said no prob..looks cool..itll take 10 min. it did and i loved it...the only folks who "get it" typically are cyclists who notice it..
Did you shave your arm to get it done? If so, how does it look with the hair grown back. (I ask because I'm easily as hirsute as you are which is one reason I've never gotten one. i think it looks fine when all the hair grew back, but my body hair is red; if it was black or dark brown, that might occlude the image. since my tat is a copy of an archaeological find, and the artist did a wonderful job with the stone texture, i just tell people that all the hair represents the moss that would grow on stone in the Celtic climates. Since we have a few members who mentioned tats who are new... thought I'd bump this topic so they could see and post! Also if you have new ink...post away! those are sweet tats...I really admire that you stand by your decisions so much that you have many tattoos showing the world exactly how you think. was the diamond under your chin very painful (more than normal)? I've never seen any tats under the chin before. My one and only...so far. It's a memorial for my grandma Ella Wilson Borland Scala. Graced the world in Glasgow- left the world in New York. Roman numerals are 2-9-9-4 the outer circle with 12 notches in it represent time, whether it's the hours of the day or months in the year. Circles also represent eternity. The pentacle inside represents the elements of the earth. the broken crimson heart represents the heart ache of a bleeding heart that i've felt since that day as well as the cause of her death. All in all...it makes me feel as if she is always with me and behind me in all that i do. I originally wanted the placement higher...on the nape of my neck in hopes that it would be painful (pain helps people remember, at least it does for me) but, it looked funny so we lowered it. I want to add to it. maybe adding her name in kelmscott (it's a font i dig). nice work girl...i dig it. im still working on clan links to make SURE befor i get clan and buckle on the calf. but i need some ink soon. I have a few more, but these are my favorites. Oh, oh, can I play? Please?! So the sleeves are phase one. Going for a full body suit, all bees. Wrist to wrist, neck to ankle. 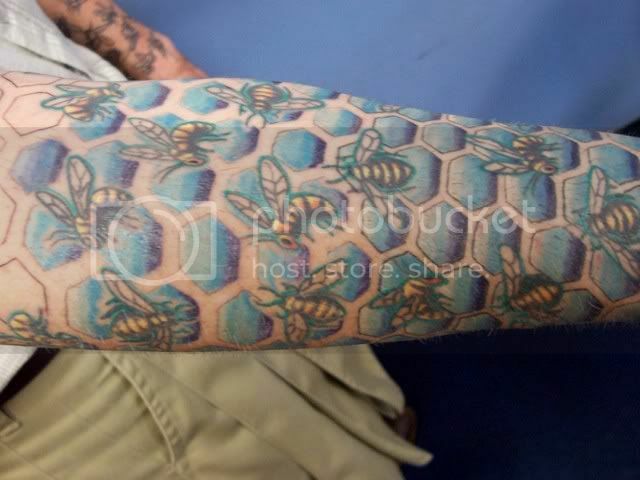 Comes from a life long love and appreciation for bees. Well, that and I'm a bit eccentric. Starting the chest next week and we'll just continue from there after Tobi finalizes the design for the Queen Bee for my back. 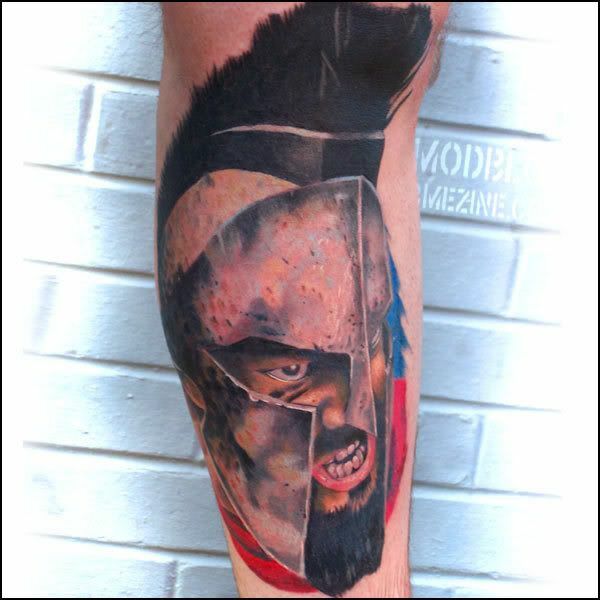 My artist is Tobi Wallace, found here, http://www.tats4u.com. 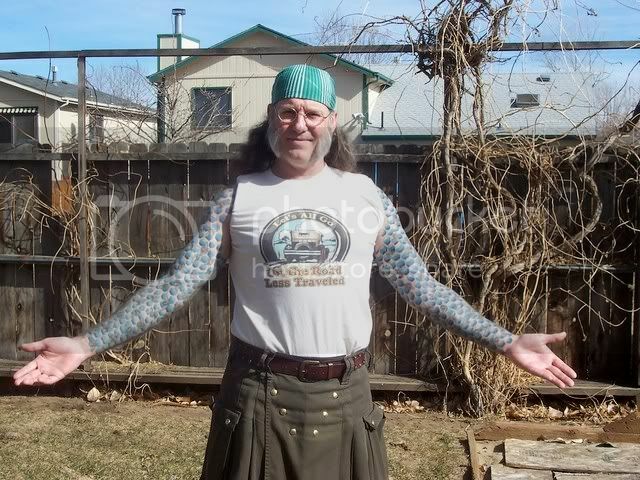 Just out of curiousity, what do those of you with full sleeves do for a living? 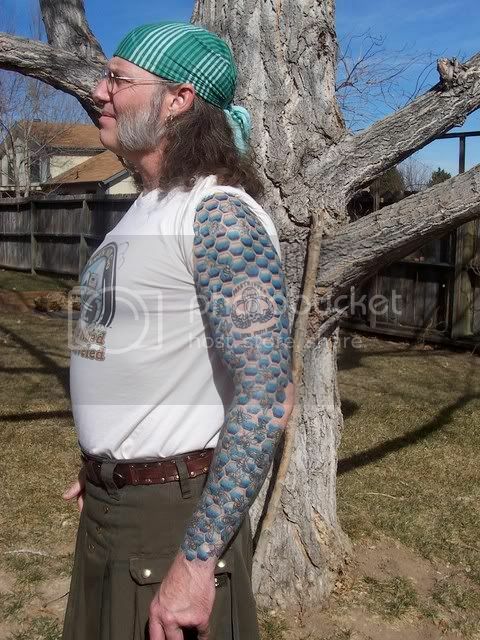 I want to finish off my sleeves, but I'm yet to find a place of employment that will tolerate it. The place I work right now has no guide lines or written rules about visible tattoos, but I've been told in no uncertain terms that if I were to finish my full sleeves that I would most likely loose my job. (they of course would never actually say that they were firing me because of my tattoos, they would trump up some other excuse) Why is it so hard to find a tolerant company to work for? I am the closing manager at a small independent coffee shop, Catalyst Coffee. I am trying to acquire some new skill sets and working towards working for myself, doing leather work, possibly kilt making, I don't know. I am pretty happy with my coffee shop family and am not in a big hurry to leave. Just a question, but if you were to get your sleeves finished and were to wear long sleeve shirts that concealed them, would you have to worry about your job? 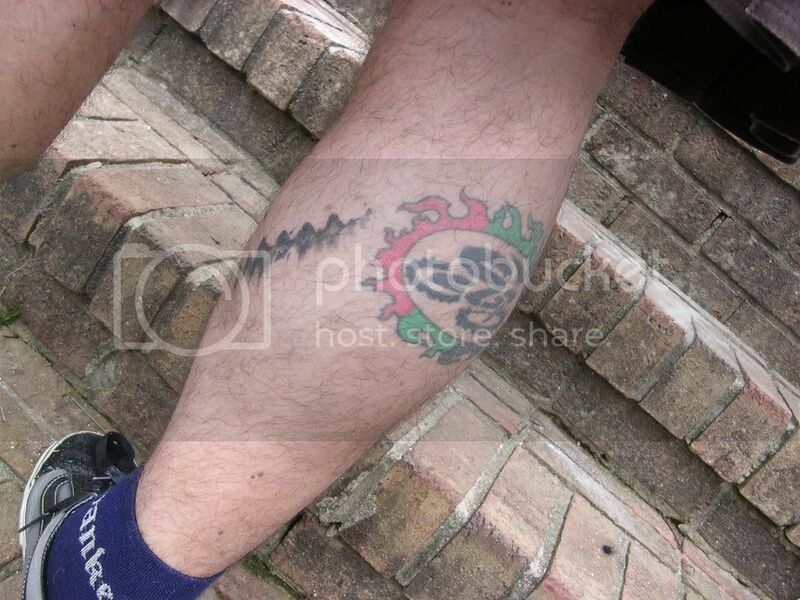 As for tolerant companies, I know of a few here in Philly that are more tattoo tolerant, but that's due to the owners being of a younger generation than most. I am all over it CJ. Taking notes. Still no ink for me, can't decide. My second favorite is my most recent, which consists of the Band of Brothers, and the Father Knot, incorporated with my boys initials, (E-Ethan and G-Grant)...and yes, the band goes all the way around. Thanks! I am pretty pleased with them myself! 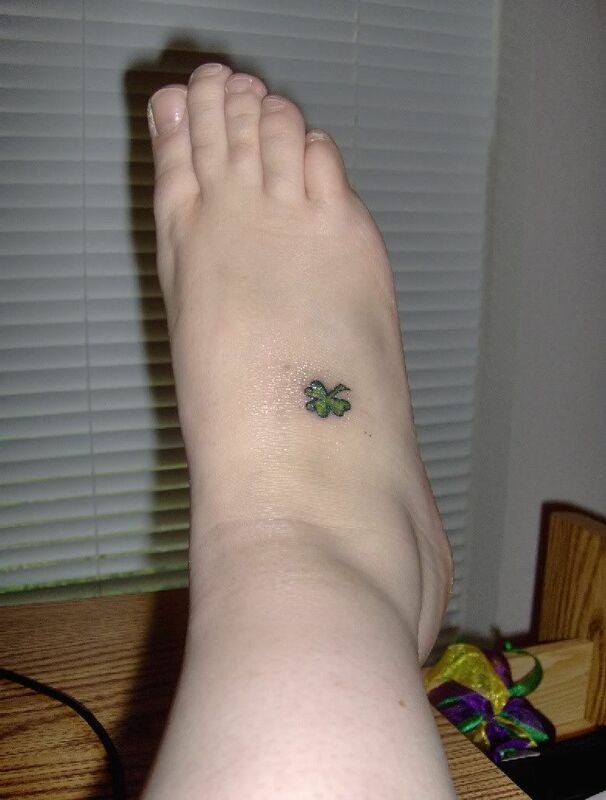 Ahh, I didnt know you were tattooed, Holly! I only have one but I have 3 more I designed,one for each son. Im just too chicken to go and have them done. I am loving everyone else's. Keep posting! 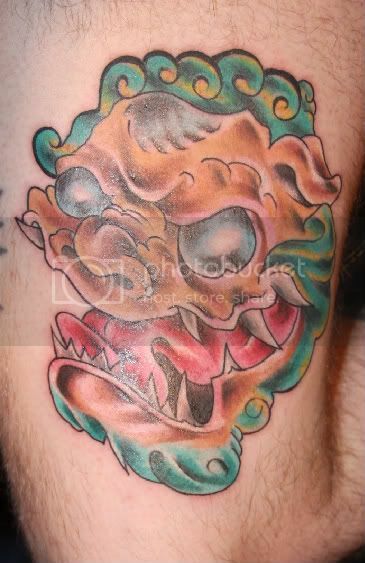 Okay, as had been posted this weekend was a tattoo convention here in Philly. I had tried to get a few of the other PA locals to try and make it out, but had no luck... well, I went to the show not expecting to get work done. 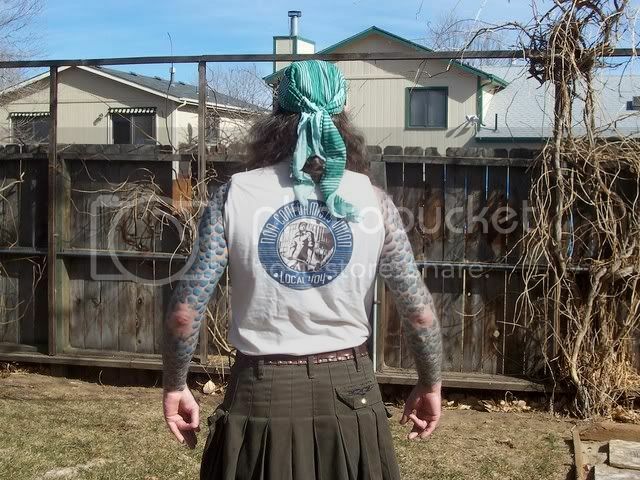 I wore my Alphakilt and my black BotK shirt, had a couple girls exclaim, "Cool, a kilt!" Was nice. Didn't have any bad comments or anything, even got a laugh at the end of the night when I had to lift my kilt to show the start of my new tattoo project. Here's a picture I just took, so it's kind of crappy and I'll have a better one taken tomorrow.